My Mediterranean roots have intensified as I’ve grown older. I’m not referring to my food love affair, which started with my first breath, or tendency for passionate discourse (dramatic to say the least), but rather my desire for afternoon siesta – a result of my waning energy throughout the day. Some afternoons I feel so depleted my only focused move is to the couch for a nap. GET SOCIAL. . .Social interactions are stimulating. Make a five-minute keep-in-touch call to your wife, child, a friend, or retired colleague. Ask your colleague about weekend plans. It will lift your spirits and motivate you to finish your work. “Your environment has a huge impact on how productive you are. SEE THE LIGHT. . .A bright light boosts mood and reawakens the brain. Sit near a window, take a break outside, or switch to a spot with lots of natural light and work there for 15-30 minutes. You will feel and be more productive. SHIFT ENVIRONMENT. . .During college lecture courses, I would try to sit in front, closer to the energy or action in the room. Being highly visible also frightened me out of potentially dozing during the driest courses. Sit closer to your supervisor during the afternoon meeting or leave your office door open to ensure your eyes remain open. DON’T RUN DRY. . .Drink water. 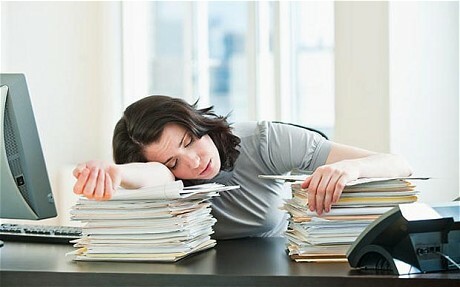 Dehydration is a common cause of fatigue. Keep your water bottle filled with sparkling water— that wonderful fizz will help keep you awake. MIX IT UP. . .Switch tasks. Instead of nodding off working on an expense report or answering emails, call a boisterous or fun client, or make your email a See-Mail: Get up from your chair and deliver your response in person. The recipient will appreciate the extra effort. GET SWIFT. . .Taylor Swift. Shake it up—your body, that is. Physical activity is the best break of all. Walk down the stairs and take a break in the lobby. Or, start a corporate workout trend: Stand up in your cubicle and do some deskercises. TUNE IN. . .Keep an afternoon playlist of invigorating music. Put in your ear buds and get your upper body grooving in that chair, or start conducting that mini-symphony. TAKE A DIP. . .In the sink. For a dramatic jolt, head to the rest room and turn on the tap. A little cold water on your face, back of your neck and wrists will give you a temporary energy boost. ENJOY A JOLT. . .If all else fails, grab a little caffeine for a boost. It takes about 20 minutes to feel its effects, so enjoy a small square of dark chocolate about 90 minutes after lunch to stave off the slow descent into sleep. If you’re still slipping off into dreamland regardless of what you try, get a medical checkup. In most cases, though, a change in your environment, activity level, or behavior will be all the boost your sleepy body needs to refresh and recharge. This entry was posted in Energy, Focus & Attentiveness. Bookmark the permalink.